Firstly, I’ve always had a fear of flying. Growing up, traveling in a large airplane made me extremely uncomfortable, especially whenever I would see the tips of the wings wobble in turbulence, convinced they were about to snap off, or when the engines spooled down at cruising altitude, fearing they had suddenly died. Heights still make me a little nervous, but mostly in tall buildings (I don’t have nightmares often but the one recurring nightmare always involves being in a tall building that is unstable). Secondly, and more importantly to this story, is that I tend to become fascinated by things that I’m afraid of. It was only a matter of time before I would decide I would be drawn to learning to fly. 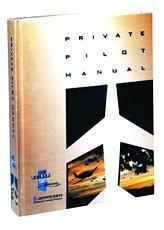 I never had a particular interest in learning to fly. It just wasn’t something I had ever really considered doing, or really as something I would find interesting. 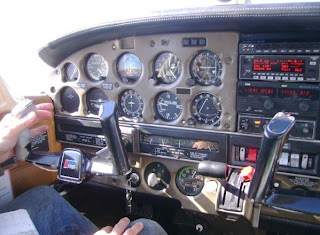 I assumed it was just too much work for the average hobby, that only people bent on becoming airline pilots or the extremely rich would ever get behind a yoke and take to the skies. I was content in taking to the skies (and the occasional alien space station) via computer screen. One of the main concepts of aviation accidents is known as the chain of events, where breaking one link will break the whole chain. 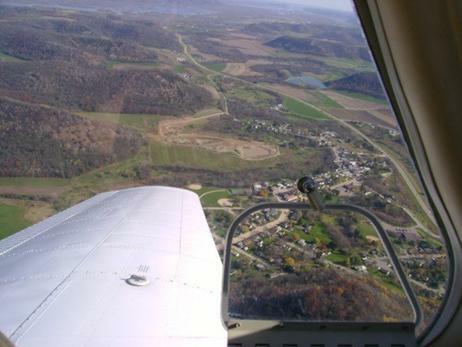 It’s the analogy I like to use when looking back on all the small events that lead to me finding myself in the front seat of a small airplane, suddenly 50 feet off the ground and climbing. I partially blame my then-roommate for the first link. There was a small aviation program at my undergraduate university (a minor in Aviation after taking their few classes which were rarely offered). 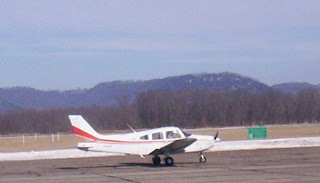 One class was offered regularly, their fundamentals in aviation class which many took as a general education credit, but others took as a certified ground school course. My roommate ended up taking this class and enjoyed it. I believe this had something to do with the change of pace of taking a class about aviation, but partially it had to do with the school’s aviation professor, who is known by many for his excess of personality. One day I came home from class at the end of the semester and he was flipping through the textbook and describing the craziness of the class to a friend that was over. He talked about taking a tour of the small airport in town for the class, how much he had to learn, the airport mascot dog, and how they offered flying lessons. 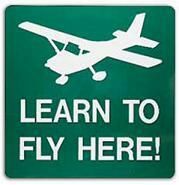 I thought that was strange, as I always imagined flying lessons as taking place at big airports with big organizations and big schools. This intrigued me and stuck in my mind for weeks, although I never considered acting on it, as I just barely made it through that semester and ending up dropping due to financial reasons. The following weeks were filled with worry and stress as I found myself without a job, no school to attend, and a very small amount of money to survive on until I could figure something out. I had $50 that I had received from home but was assured that would be the last amount for a very long time. Whenever I need to think I like to drive around, it relaxes me and lets me focus. One day I was driving around, almost out of gas, when I drove past the airport. It seemed deserted, but recent events had left me in a mental fog, so I went to see what was going on. It was a small non-towered airport with one rusty gray hangar/office and a small brick building. I decided to check out the brick building, noticing a few of the “Learn To Fly Here” signs on the front door. To my luck the building had a sole occupant, one of the younger flight instructors who happened to be there that day, sitting in the “pilot lounge” watching TV. I didn’t really know what to say, other than I was interested in learning about flying lessons, but not ready to really make any commitments, as I really had no money. I assumed I had caught them off guard and viewed me as an odd person showing up randomly like that, but in retrospect I have a feeling that’s how many of these stories start. He gave me a brief overview of the program which was based on training at a speed determined by the learner, with flying lessons scheduled individually and when able. We went next door and I was showed the company’s other airplanes, met the owner, the mechanic, and the airport dog. We then went to another hangar which housed the flight instruction planes. I had never really been around airplanes before, even if they were small and nearly ancient, so I was just buzzing on a small experience overload so didn’t say much. I was talked into sitting in one of the small planes, just to see what it is like behind the controls of a plane. I feel like I would have been content with just that experience. I tend to get buyer’s remorse, and I hold onto my money unless I need to spend it, especially when money is tight, but I never regretted the decision to blow my last $50 on that first flying lesson. Of the two training airplanes I was introduced to (a Cessna 172 and a Piper Warrior II), I chose the Warrior for my first flight. It felt slightly roomier, the seats felt closer to the floor giving me a sense of stability like sitting in a wide low-riding car. Sitting in the 172 made me feel like I was in a top-heavy SUV. Aside from those preferences I would recommend both aircraft (they are more alike than they are different). Although it was just an introductory flight it was treated like a lesson and I was showed all the typical procedures I would go through during a regular flight, such as the pre-flight inspection and being shown all the checklists I would refer to for all the different phases of flight. I tried following along but it was already a lot to take in for one day. One thing I remember being surprised about is how light the plane is, and how easy it is to pull it along even by hand. It also made me nervous to think that the last-minute determination of the plane’s ability to fly would someday be made by me. One thing that always brings me back most vividly to memories of flying is the unique sounds associated with starting a small plane; flipping switches, clicking on the master switch, the low hum of the gyro starting up, the “whoop-whoop” sound the strobe beacon makes in the headset as it pulses, the traditional shout of “clear prop” (although shouting anything seems to do the trick), the whine-crank-puff of the engine starting followed by the smooth chopping sound of the propeller running, and then the combined sounds of listening to the automated weather report and the VOR Morse Code identifier over the headset. The other surprising aspect of this was how anyone could take off and land here whenever they wanted without permission. I had always assumed all airports had some kind of air traffic controller. Little did I know that only about 2% of airports in the US have air traffic control towers. After a long string of checks to make sure the airplane’s instruments were working (the “Flow”) the flight instructor made a general announcement on the radio to anyone listening that we were taxiing to take off. Then plane slowly rolled forward, then jerked to a stop as the instructor made sure the breaks were working, then continued rolling along the tarmac towards the runway. I liked that the plane was steered on the ground using the foot pedals, almost like a tank; push in the right pedal, the plane goes right, push in the left and it goes left. The top half of the pedals control the brakes, allowing for control of the individual of each brake for tight turns. These were the minor details that I had to overcome after years of driving cars. We pulled up to where the taxiway meets the runway and stopped to run more checks and make sure the plane would run under increased power. This check involved holding the brakes down and gunning the engine to make sure things like oil pressure, temperature, etc, were normal, and that nothing would happen when the engine was running at higher RPMs. This also made the plane shake like a banshee, as it was making enough thrust to pull the plane through the air at nearly 90 mph. The propeller wash over the wings and the tail causes it to whole plane to shimmy side to side and bounce up and down, as if a group of people were outside rocking it back and forth. If I had to anthropomorphize, I would say this is when the plane gets anxious, like when you put a leash on a hyper dog that understands this means it’s time to go outside. It’s a very contagious feeling. All systems go, the sky is clear. “Are you ready?” the instructor asked, the headsets making it sound like a long distance phone call. “Yes”, I heard myself say over the headset. We rolled forward and turned to line up down the runway, a mile of smooth blacktop broken only by occasional yellow stripes. With no time to waste the throttle is shoved all the way forward and the little plane is free to do what it is made to do. With only three wheels the plane is slightly clumsy on the ground, and at high speeds it weaves side to side as control is transferred from the front wheel to the tail rudder (vertical stabilizer). The wheels, designed for function rather than comfort, transfer each pass over a repaired runway crack up into the seat, and the ride becomes bumpy. At around 45 mph the instructor pulls back on the yoke and the nose points up, blocking the view of all but the end of the runway and relieving the nose wheel from its burden. A few more miles an hour and suddenly the wheels are suddenly silenced, plane continuing to weave back and forth but on a smooth cushion of air. I looked down through my side window and saw the ground being left behind. Seeing the town I had lived in the last few years from the air really was an exceptional experience, that’s all I can really say about it. It’s such a beautiful part of the country that just can’t be appreciated from the ground. There is a nearby bluff which overlooks the city and it does not compare at all to flying through this area in a small plane. I remember looking down at that overlook and thinking how foolish I was for thinking it provided the best view of the area. I enjoyed this all so much that I completely forgot that I had a fear of heights and flying. Every time I get into a little plane, I forget that minor detail. After a few minutes of just seeing the area I was then asked if I wanted to try flying the plane. I don’t remember feeling at all doubtful in my ability to do it. It’s just a vehicle, and I knew it probably wasn’t as difficult as balancing plates on a stick while riding a unicycle or it would be unsafe. I think years of playing video games helped (honestly, I really do), but it really was quite a unique experience taking control of the plane (albeit just a perceived control as the instructor was making sure I was safe the whole time). 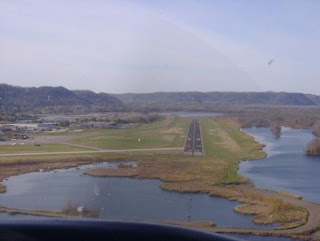 Whenever I take passengers flying I always give them the opportunity to try this, it is probably the greatest thing someone can offer using their pilot’s license. It all felt very natural to me and I quickly caught on to what worked and what made things worse (Less is more. These little planes are designed very well to fly straight and level with minimal input from the pilot). 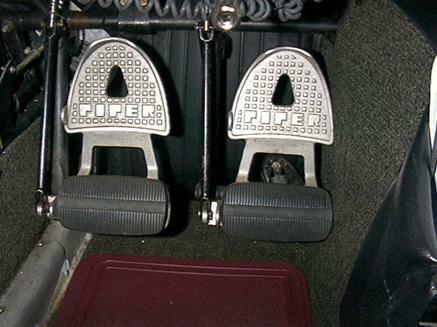 To those that ever have that feeling of being so used to driving their car that it becomes just an extension of themselves, this same thing happens in a plane, and maybe even more so. You don’t feel confined to the cramped little airplane; it’s as if your consciousness extends into the wings itself and the giant sky that is now your playground. It’s almost an out of body experience. I just wanted to buzz around and take it all in. Before I knew it we were landing. We landed and were back on the tarmac shutting down the engine, the propeller jerking to a stop. The world sounds very strange for a few minutes without the odd noises, the distant-sounding words in the headset and the hum of the engine. And the sweaty hands. For a while I tended to hold onto the yoke harder than necessary. This would make my hands get really sweaty and turn white, more than once I had to switch hands as they would fall asleep from my death grip. I eventually got over this by being told to imagine holding an egg between my hand and the yoke without breaking it. I didn’t stick around for long, I had to go home and stew in my thoughts. I assured them I would be back someday.